SEE our tour to Meteora and Delphi combining train, taxi and bus. Daily departures, travelling on your own or in a small group. Travelling by train in a scenic and smooth ride. Visit well hidden spots that other travellers never experience. Learn the culture and history of the place from the local leader. EXCLUDED: Lunches and dinners, Entrance fees to the monasteries and the archaeological site. I had a fantastic experience with Astoria Travel and Kosta. He is very efficient, he know his stuff and he is one of the best in his job. He helped me plan a trip to Kalambala and Delphi by train, private taxi and Intercity bus. He arranged everything and all went very smoothly like a clock work. He takes care of everything, so you don’t have to worry about anything, all you need to do is sit back, relax and enjoy a well organized trip. For real pleasure and nice memories, combine touring with walking and hiking. The sight of the Meteora is a unique experience, but walking on the well marked paths, is breathtaking. Experience and observe the beautiful local flora and fauna between the huge rocks. Step off the tourist trail and discover the little-known routes that most visitors do not get to see. On this morning hiking trip, you follow your leader-guide on a leisurely hike in the narrow well marked path that leads into the valleys set on the foothill of the great rocks all the way to the Grand Meteoro Monastery. Along the way, you pass from the out of the way Ypapanti monastery and some of the smaller rock monasteries, and listen to fascinating commentary about the formation and history of this unique site. There is a number of hiking paths in the area, some are more difficult than others. The routes chosen to follow are not too difficult. Wear the proper shoes and be careful where you step, other than that it is a great experience to become one with the nature. 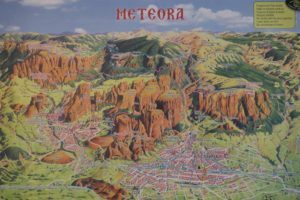 “Go hiking in Meteora” and see this unique geological phenomenon walking. Experience a unique convergence of nature and spirituality unlike any other place in Greece. Discover and follow the paths of the monks. This is the opportunity to see the monasteries and landscape from a different perspective. The views of the town of Kalampaka at the base of the rocks and the valley of Pineios river are stunning. Plus a visit to a monastery (Great Meteoron or Varlaam) is included. The Professional Hiking Guide will be with you to give you all the information you need about the area and wherever is needed, transport is organized on a minibus. Distance: 8 km | Duration: 4 hrs | Difficulty: Easy. If you are an active person you should join this tour. The best season for walking at Meteora is Spring and Autumn. If you are walking in the Summer, you will need to have a lot of water with you. You should avoid walking in the heat of the day (11.00 – 4.00 pm). In the Winter you should also avoid areas that are very wet and slippery. You should wear shoes, correct for such sports. Please respect the holiness of the site and maintain the proper dress and behaviour. Witness nature at its best and admire the historic monasteries on this morning escapade. The views are majestic and our tour guides will make sure you enjoy them through the most efficient paths, all while informing you about the history and tales of the area. The hiking tour of Meteora is best possible way to experience this historic site and geological mystery. On this tour you will walk through paths less traveled by the masses, which only locals are able to guide you through. Follow the trails taken by the first hermits and monks to settle in Meteora in the 9th Century AD, enjoy views which most visitors do not get the opportunity to see! The tour begins from the Doupiani rock, right under the remains of Pantokrator monastery. We continue through the imposing sandstone mountains and move to the north side of Meteora. 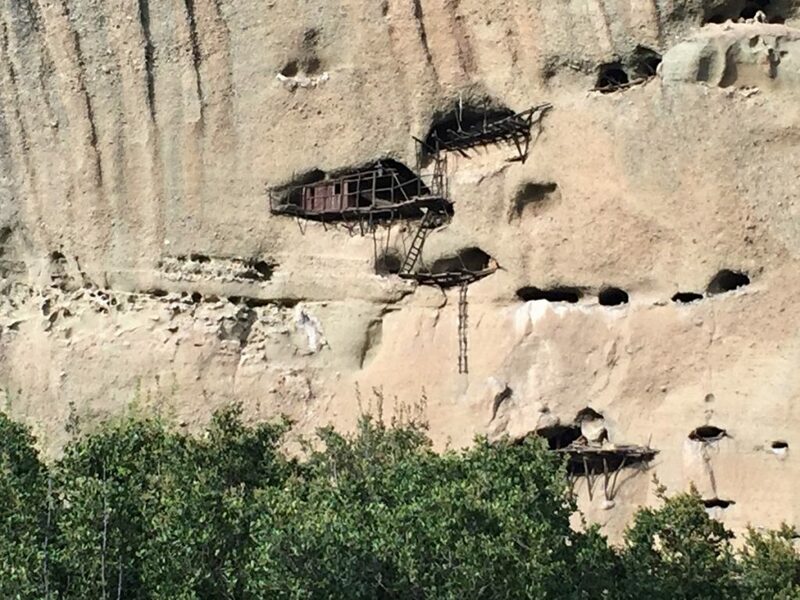 There we visit the concealed monastery of Ypapanti and the remains of St. Dimitrious Monastery. While visiting these landmarks, you will hear the history, legends and dark tales associated with the area and each site as told by the locals. Visit the Ypapanti monastery from the inside (it is open until October), and then the monasteries of Great Meteoron or Varlaam. After filling your soul and absorbing history, we begin the last leg of this one of a kind tour by taking the original paths monks used before more modern road construction began. Take the 4 hour morning tour and explore Meteora. 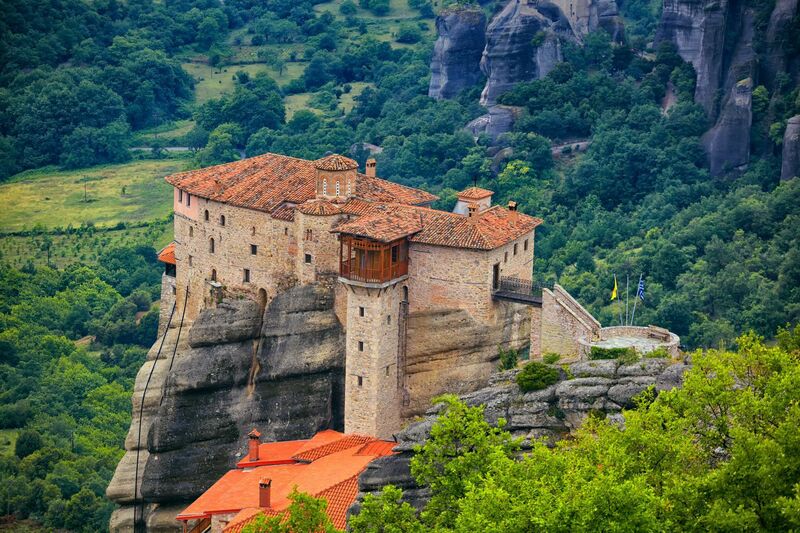 Many centuries ago, an important monastic community was formed on these gigantic rocks in Greece. The Meteora Morning Tour from Kalampaka is the perfect choice to explore the Meteora Monasteries. History, science and mythology alike have attempted to explain the formation of the sandstone mountain, but it is still a mystery which makes it one of the most unique places in the world and places it in the UNESCO list. Its deep religious history offers many tales and legends. 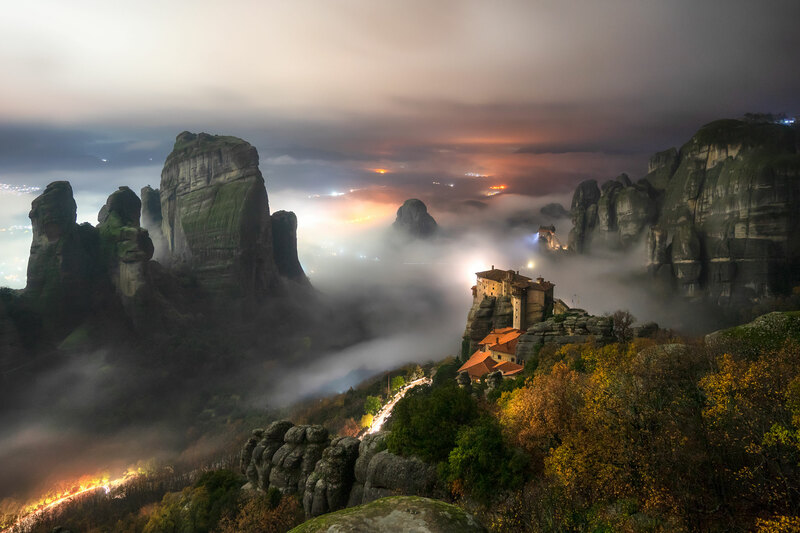 It is estimated that the first hermit monks settled on the Meteora rocks around the 10th c. AD. It has since been a Christian sanctuary with a very complicated history. 24 monasteries were built during its history, 6 remain open today. Go on a daytime tour of 3 of the 6 remaining monasteries in Meteora, learn the history and hear dark tales of the area from your local guide. Enjoy the beautiful surroundings and take photos from secrets positions. Give yourself the privilege of absorbing some of the most breathtaking sights, views and colors nature has to offer. Combine that with learning the history of the area and hearing impressive tales about the first hermits and monks who settled in Meteora, and you have a complete day of body and soul fulfilling activity. Discover the natural beauty and the cultural heritage of this area. Many visitors never learn or hear that just few km away from Kalampaka there is one of the most important prehistoric caves not only for Greece but for the entire world, with archaeological findings dating back to 130,000 BC! (If the Grand Meteoro is closed, the Varlaam is visited instead). The monasteries have a strict dress code. Wrappings are provided. 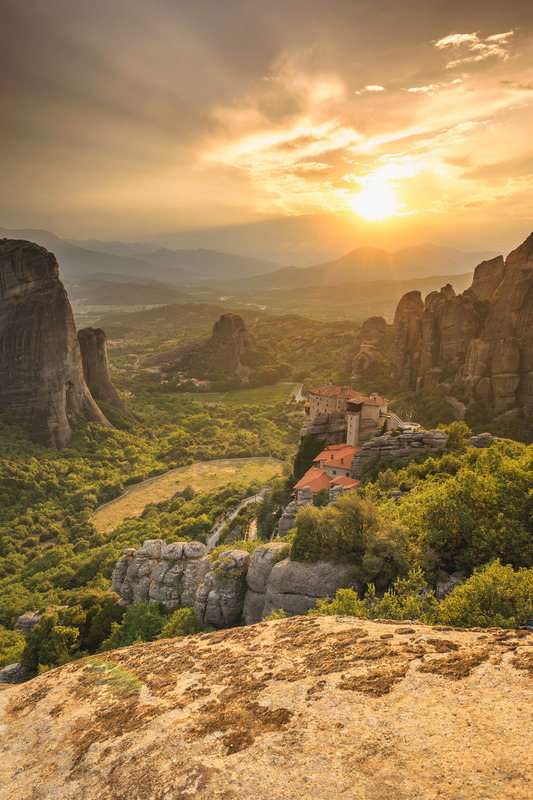 Enjoy a beautiful sunset from the Meteora rocks. If you happen to be at Meteora on a tour, finish the day with a Sunset Tour on the rocks watching the sun hiding behind the mountains. Meteora is a unique site, a complex of sandstone rocks listed in UNESCO’s Sites. It is the second largest monastic site in Greece. 6 of the original 24 monasteries are still open to the public. The history and myths are endless, as are the paths to explore this unique area. Visit sites which tell the 27-century old story of the region like the Badovas and the surrounding caves. You have the chance to combine the Sunset Tour with the Morning Tour or the Meteora Hiking Tour for a full day experience. The leaders are local guys willing to offer their knowledge. Walk on well paved paths and hear the history and legends of the area. In the 3.30 hour afternoon SUNSET TOUR, organized by our partner in Kalampaka, you visit either the ROUSSANOU, or, the St. STEPHEN’S nunneries, the old Byzantine church of Mother Mary in Kalambaka, and the 1,000 years old hermitages and cave dwellings of Badova. Experience a beautiful sunset, and capture beautiful photos. Starting at +/- 16.00 the tour will take you to places that only the locals know. Enjoy amazing views, learn about the history, and traditions of the place. High up on the rocks, you will see the 1,000 years old Bandovas’, the cave dwellings on the rocks, and learn the history of the very old Byzantine church, built on the ruins of an ancient temple dedicated to god Apollo. The Dormition of Mother Mary in Kalampaka is one of the oldest churches in Greece, a real monument of special Byzantine architecture. Driving on the rocks, the driver will stop on a flat opening, from where you will take dozens of photos of a beautiful sunset. When the sun touches the mountains at the background, a complete silence is all you hear, and that is the moment that you understand why Meteora was chosen by the monks to build the monasteries here. It’s the moment that you also feel the need to meditate on the beauty of the creation. Stop at the right spot for taking the sunset photos. – 2.00 € per person, the entrance fee to the Byzantine church of Mother Mary. – Wear the proper shoes and proper dress. Men wearing long trousers, and women long skirts. However at the entrance of the monasteries you are provided with wrappings to follow the dress code and show your respect. Drive along the scenic coastal road past the beach resorts to the most southern point of Attica to Cape Sounion where the white marble pillars of the Temple of Poseidon stand. En-route there is an extraordinary view of the Saronic Gulf and the little islands offshore. An evening drive past the illuminated Acropolis and stop for a drink at a nearby cafe to enjoy the view. Dinner at a typical Athenian taverna with bouzouki music and Greek folk dancing. Drive south to the Corinth Canal that connects Aegean and Ionian Seas. Visit the ancient town of Corinth where St. Paul lived and preached for almost two years. The remains of the city which include the Agora and the Temple of Apollo (6th c. B.C.) clearly show how rich and important Corinth was in ancient times. With the professional tour guide you will explore an ancient city that several empires fought over throughout the centuries. Before returning to Athens stop at the site of the ancient port Kechries where St. Paul disembarked. Home of the Sanctuary of Apollo, Delphi is the most famous site in Classical Greece. On the slopes of Mount Parnassus, hear thee myths about the oracle and tour the excavations. Walk the Sacred Way to the 4th century Temple of Apollo and view the statues immortalising the strength of the athletes who once competed in the Pythian Games held in honour of Apollo and the Arts. A visit to the museum to admire the bronze Charioteer is included. After a short stop on the bridge crossing the Corinth Canal continue to Mycenae where 19th century excavations described by Homer can be seen. Visit the Beehive Tomb and the Lion’s Gate – Europe’s oldest known monument. On to Epidaurus via the port town of Nauplion to see the 2,000 year old amphitheatre known for its perfect acoustics. One Day Saronic Island Cruise (with lunch) at discounted price. Pick up from Athens center and transfer to the port for embarkation. Visit the beautiful islands of the Saronic Gulf; Aegina, Hydra and Poros. Day 1 – Depart Athens driving through the towns of Thebes and Levadia and the quaint village of Arachova, famous for its colourful carpets, to Delphi. Visit the Sanctuary of Apollo situated on the slopes of Mt. Parnassus, the Treasury of the Athenians, the Temple of Apollo and the museum containing the ancient Greek bronze sculpture “the Charioteer” and many other masterpieces. Dinner and overnight in Delphi. Day 2 – Breakfast at the hotel. Morning at leisure in Delphi. Enjoy the scenery, return to the museum. Afternoon departure for Athens. April – October on Tue. & Wed.
Day 1 – After short stop at the bridge crossing the Corinth Canal continue to Mycenae where 19th century excavations described by Homer can be seen. Visit the Beehive Tomb and the Lion’s Gate – Europe’s oldest known monument. Continue to the lovely port town of Nafplion. Afternoon at leisure. Dinner and overnight in Nauplion. Day 2 – Breakfast at hotel and morning at leisure in Nafplion. Depart for Epidaurus to visit the 4th century B.C. theatre famous for its perfect acoustics. Return to Athens early this evening. April – October on Tue., Wed. & Sun. Day 1 – Depart Athens driving through the towns of Thebes and Levadia to Delphi. Visit the Sanctuary of Apollo situated on the slopes of Mt. Parnassus, the Treasury of the Athenians, the Temple of Apollo and the museum. Overnight in Delphi. Day 2 – After breakfast, depart Delphi and enjoy an interesting drive through Central Greece, Thermopylae, famous for the heroic defence by Leonidas and his brave 300 Spartans against the invading Persians. (short stop) and the town of Lamia before reaching Kalambaka. Overnight in Kalambaka. Day 3 – The breathtaking UNESCO World Heritage monasteries of Meteora are our first stop today. Following breakfast set out for Meteora to visit the ageless monasteries containing priceless historical and religious treasures, which appear to be suspended in air on top of huge granite rocks. With the professional tour guide visit two of the six Eastern Orthodox monasteries that cling impressively to immense, rounded rock towers overlooking the town. Return to Athens via the towns of Trikala, Lamia. April – October on Mon., Tue., Thu & Sat. Day 1 – Drive South on the coastal road to Corinth Canal. Continue to Epidaurus to visit the theatre with its perfect acoustics and proceed to Mycenae to see the Lions’ Gate and Beehive Tomb. O/n Olympia. Day 2 – This morning visit the Sanctuary of the Olympian Zeus and the museum. Drive to Delphi for o/n. 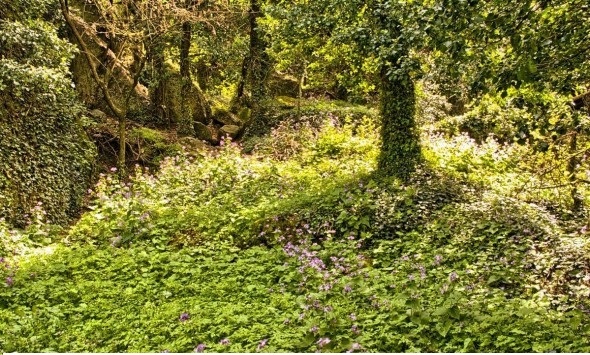 Day 3 – Walk on the sacred way and visit the Castalia Spring, the Sanctuary of Apollo and the museum. Return to Athens stopping at the picturesque village of Arachova. April – October on Mon., Tue. Thu & Sat. Day 1 – Drive via the coastal road stopping at the Corinth Canal and on to Epidaurus to visit the amphitheatre with its perfect acoustics and proceed to Mycenae to see the Lions Gate and Beehive Tomb. Overnight at Olympia. Day 2 – This morning visit the site of the first Olympic Games; the Sanctuary of the Olympian Zeus and the museum. Drive on to Delphi for overnight. Day 3 – After the visit at the Sanctuary of Apollo and the museum, depart for Kalambaka passing through numerous picturesque villages and typical towns of Central Greece and a short stop in Thermopylae. Overnight in Kalambaka. Day 4 – Visit Meteora this morning and among striking scenery, perched on top of huge rocks which seem to be suspended in mid-air, stand ageless monasteries where there are exquisite specimens of Byzantine art. Return to Athens via Trikala, Lamia. 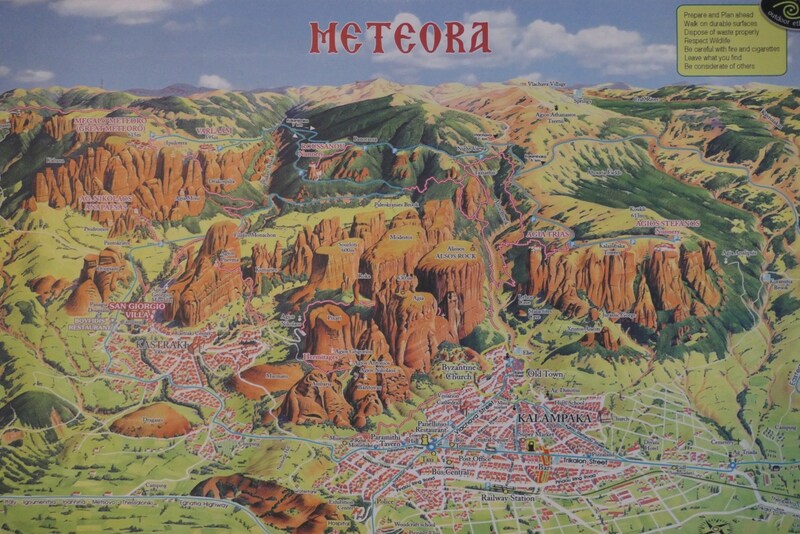 SEE ALL THE TOURS that visit Meteora in guided tours or independent train trips.